On behalf of everyone here at CoinNews, we wish you the absolute best for 2009. 2008 was a spectacular year and we’d like to extend a special thank you for the many contributors that have helped make CoinNews a hangout for so many collectors from around the world. For all, thank you so much for the time you’ve spent with us in 2008. We’re humbled by your support. 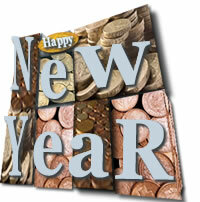 May you find 2009 to be a year of health, happiness and exciting coin discoveries. Precious Metals Tank, Coin Collectors Happy?